Early in the morning of Mother’s Day, 2012, SPS Ester delivered her final foal — a typey redheaded colt, by Rubignon (Rubinstein/Donnerhall), the dressage sire of Swedish National Team fame. Now Ester (by Hanoverian Sire of the year Eiger I) has been retired from the herd, after giving us so many charming, gentle and talented offspring. Thank you, dear Ester! Rocketman is a pretty boy – confident and sweet, with long straight legs, and easy charm. I’ve attached a few pictures taken at 3 and 4 years old. Rocket is registered with the German Hannoverian Verband, and will be a match for someone seeking an easy, athletic partner, bred for success! 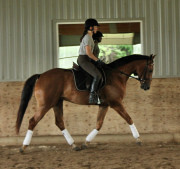 I expect he will do well in dressage or hunters – or perhaps eventing. 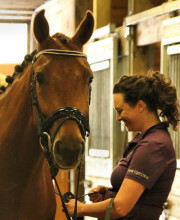 The first videosnippet below is of a recent schooling session. The second was taken a few weeks previous, just started W-T-C. 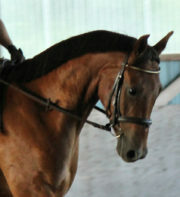 The third video shows him “first time” free jumping – he loved it, and got his lead changes. 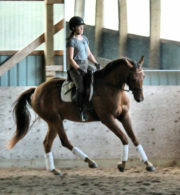 His trainer describes him as “16hh with a loving, affectionate personality and true desire to please. He has three quality gaits, is soft in the hand and is easy to sit….” Good behind, with a very engaged personality and willing to work. 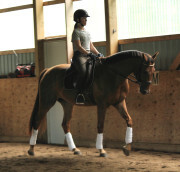 Sold to a talented Canadian junior rider – a super “forever” homr..